Founded by Mana Contemporary Director Eugene Lemay, the Mana Museum of Urban Street Arts will be interactive, comprehensive and the first of its kind in the world. Focusing on street art and graffiti, the Museum of Urban Arts will be located in a 100,000-square-foot former ice factory near the Holland Tunnel entrance in New Jersey. The Mana Museum of Urban Arts’ mission includes: showcasing contemporary street artists from around the world through rotating interior exhibitions, large-scale exterior murals, and through an artist billboard; documenting and preserving historically significant works with a permanent collection and media center; educational outreach; and fostering creativity and community among artists through workshops, artist studios, and public works. 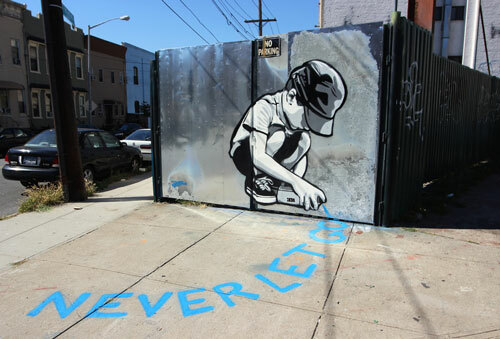 Logan Hicks is a New York-based stencil artist. 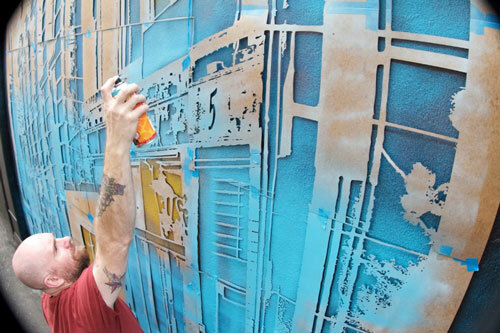 A pioneer in the stenciling community, he is known for his large scale, photorealistic approach to the medium. He has exhibited in 25 countries including Hong Kong, Melbourne, Oslo, Paris, London, as well as throughout the U.S. He has curated numerous projects over the years and founded the Workhorse Collective in 1995. Eugene Lemay, founder and director of Mana Contemporary, has brought on veteran street artists Logan Hicks and Joe Iurato to curate the programming. Artists selected by Iurato and Hicks will be given the support and opportunity to create works as large and as ambitious as they can conceive. Joe Iurato is a New Jersey-based street artist. His placement-specific photography of stenciled works blurs the line between art and performance. He has curated events such as the Aqueduct Racing track artist mural program, as well as working with corporate clients such as ESPN, Nike, NBA, NFL, and others. He is also a sommelier. Construction is expected to begin in June 2014 on the Mana Museum of Urban Arts at 581 Monmouth Street, Jersey City, NJ, and public programming is expected to begin in September 2014. Mana Contemporary is a leading arts destination with locations in Jersey City and Chicago. Studios, exhibition spaces, art services, and programming provide an unparalleled environment for creating and experiencing art. By exposing and exploring the artistic process, Mana Contemporary offers an exciting way to discover and learn about art while artists are enabled to experiment and collaborate across all disciplines, forms, and media. Mana Contemporary is home to the Richard Meier Model Museum, Gary Lichtenstein Editions, the Eileen S. Kaminsky Family Foundation, the Middle East Center for the Arts, Shen Wei Dance Arts, the Keating Foundry, and more.